Bathroom Marketing: Is #TweetfromtheSeat Too Much? Quilted Northern says we should, “get real about what happens in the bathroom.” So I’m going to talk about it. When I comment on and review marketing communication pieces, it’s always a big hit (Missouri, NYC, Chicago). Once I even took a picture in an Appleton bathroom, but other than that, bathroom-related marketing isn’t spoken about. That doesn’t mean it doesn’t work. Here are two examples of marketing pieces for your consideration. This mildly inappropriate message was spotted on the inside of a door in a bathroom stall. The local credit union seemed to think that a Green Bay restaurant’s bathroom was a good place to convey their message. 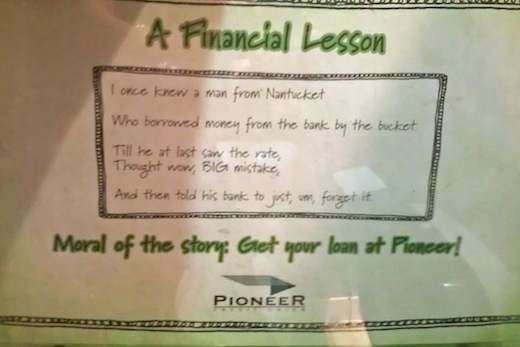 Banks and credit unions are sometimes limited in what they can say and everything needs to be run through “compliance.” But Pioneer Credit Union teaches us that that doesn’t mean you can’t have a little fun in your communication. Charmin’s Intermission I found mildly disturbing. The cute, cuddly bear family they’ve been using as brand characters for some time is watching a film together. Then an announcer informs them that it’s intermission. 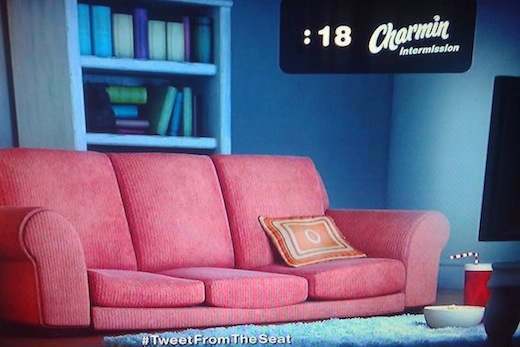 All you see then is an empty couch, a timer, and the hashtag, #TweetFromTheSeat. Yuck. Now, I just told you how I had to capture an ad in a public restroom stall, but this still disturbs me. I did check the newsfeed for the hashtag on Twitter (only because I can’t catch germs via my computer). Sure enough, people are doing as instructed. And there are currently plenty of bad puns, Tweets from Charmin, and their affiliates. Charmin seems to be managing the hashtag well and using it to their advantage, tweets are sharing sweepstakes info and what the company is doing to help those in need. Several Tweets are from the Product Poet, who I follow, too. Tying this commercial to social media gives Charmin the opportunity to reinforce their brand image and continue the conversation. And apparently people do need to have a relationship with the company that produces the most humble of paper products. Don’t think it works? Well, I’m talking about it and so are hundreds of others. I’m curious. What do you think? Is nothing sacred? Has social media gone too far, is bathroom marketing worth it?